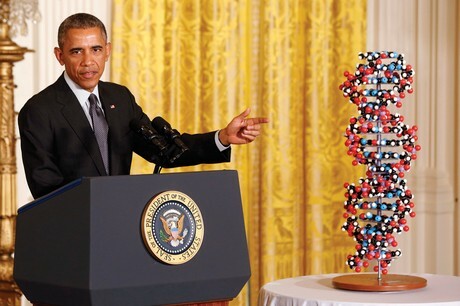 To me, the most exciting initiative that's been triggered by President Obama’s focus on Precision Medicine is the Precision Medicine Initiative (PMI) Cohort program. Its goal is to recruit a cohort of 1 million people in the U.S., all of whom agree to share their health data, including their medical histories, their health records, and their genetic data, with researchers and clinicians. The mission of the Precision Medicine Initiative is: To enable a new era of medicine through research, technology, and policies that empower patients, researchers, and providers to work together toward development of individualized treatments. To benefit from the opportunity to have medical researchers proactively detect, identify, target and safely and effectively treat any health problems that can be detected by analyzing patterns at the molecular level across populations of people. In order to accelerate medical research and treatment by contributing your own health data to the commons. To put this US initiative in perspective, in Iceland, over the past 15 years, 1/10th of the population's genomes have been sequenced and analyzed, providing health breakthroughs that have benefited both the entire population of Iceland, but also people all around the world. The Estonian Genome Project is a population-based biological database and biobank which was established in 2000 to improve public health in Estonia. It contains health records and biological specimens from 52,000 adults. It's goal is to collect genealogical, genome and health data from 5% of the population. 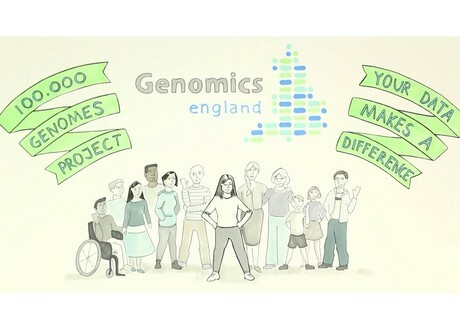 The UK's National Health Service has been implementing the UK's 100,000 Genome Project since 2012. The US Precision Medicine Initiative Cohort Program does not plan to start with whole genome sequencing of 1 million people, but it hopes to wind up there. In the meantime, the goals are a bit more pragmatic: the PMI Cohort Program will be collecting electronic health records, baseline health exams, self-reported measures, and specific panels of genes that act as pharmacogenetic markers. (These markers are used in a clinical setting to determine the efficacy and safety of specific drug treatments for particular groups of patients.) The PMI Cohort will begin with a "direct volunteer pilot." Figure out how to Recruit and Educate Patients. The responsibilty for patient education and recruitment was bundled together with the design and testing of the tools patients and familes will use to access the data in a 1-year program called the Direct Volunteers Pilot Studies Program. Import Electronic Health Records for the pilot volunteers -- In the first year, this will be done thru “Sync for Science” pilots through an open standards development process with electronic health record developers Allscripts, athenahealth, Cerner, drchrono, Epic and Mckesson. Design the security and privacy policies and framework required to protect patient's privacy while making it possible to analyze their data, and see patterns across genotypes and phenotypes. On February 25th, the White House released a Draft Data Security Policy Principles and Framework for the Precision Medicine Initiative. Public comments on this policy are welcomed thru March 25, 2016. In addition, the Office of the National Coordinator for Health IT, in collaboration with the National Institute of Standards and Technology (NIST), will, by December 2016, develop a precision medicine-specific guide to the NIST Cybersecurity Framework. Encryption. PMI data that is reasonably likely to identify an individual should be protected at-rest and in-motion using strong encryption. Examples of data reasonably likely to identify an individual include direct identifiers such as name, birth date, contact information, and Social Security Number. Encryption Key Security. PMI organizations should store encryption keys separately from encrypted data and establish policies for secure encryption key creation, distribution, access, and revocation. Physical Security. PMI data should be protected by physical security controls as well as cybersecurity controls. Service Provider Security. When PMI organizations employ subcontractors, third parties, or vendors (including hosted, cloud, or application service providers) to create, receive, maintain or transmit PMI data, PMI organizations should obtain the necessary assurances that the service provider will appropriately safeguard PMI data, consistent with the PMI organization’s security plan. Integrity Protection. PMI organizations should implement integrity protection controls that detect when unauthorized alterations have been made to PMI data." I'll leave it to the security geeks among our readers and in our Patty's Pioneers group to pour over this draft document and alert us if it's inadequate. Design and build a BioBank for storing blood and biospecimens. Develop a Participant Technology Center to identify and validate mobile health apps and sensors to collect data from cohort participants. The timeline has been quite fast for a government-initiated project. 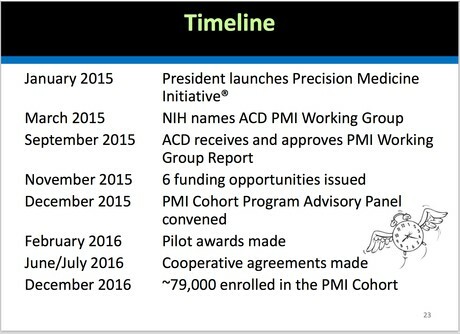 Kathy Hudson, NIH Deputy Director for Science, Outreach, and Policy, explained the timeline. The RFPs for these services were issued in November 2015. The proposals were received in December, 2015 and the awards were announced on February 25th. "That's because President Obama is impatient about this initiative," Kathy explained. 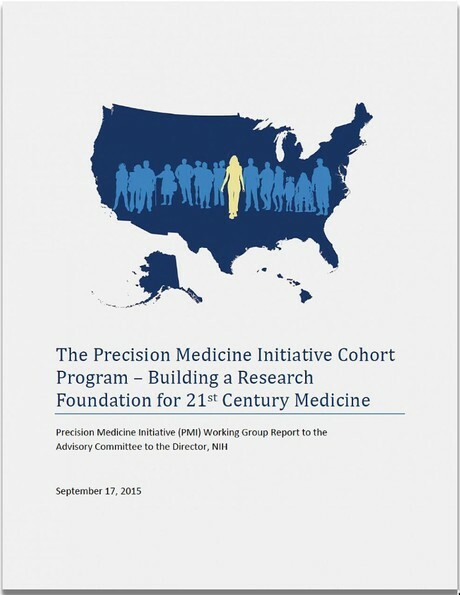 “The PMI Cohort Program will seek to extend precision medicine to all diseases by building a national research cohort of one million or more U.S. participants. Many factors have converged to make now the right time to begin a program of this scale and scope — Americans are engaging in improving their health and participating in health research more than ever before, electronic health records have been widely adopted, genomic analysis costs have dropped significantly, data science has become increasingly sophisticated, and health technologies have become mobile. The PMI Cohort Program will be a participant-centered, data-driven enterprise supporting research at the intersection of human biology, behavior, genetics, environment, data science and computation, and much more to produce new knowledge with the goal of developing more effective ways to prolong health and treat disease. Why Is Precision Medicine the "Next Big Thing?" It saves lives! It enables healing breakthroughs for many of our most intractable diseases, including many forms of cancer. It’s technology-enabled. Precision Medicine is enabled by the rapid decrease in the costs of analyzing human genomes and the concomitant increase in the availability of data mining analytics using parallel processing compute power, along with the ability to practice medicine at the molecular level, leveraging proteins, bacteria, and highly targeted and precise therapies. It will transform the way medicine is practiced over the next decade. That transformation is actually happening very quickly. The chances are good that you, or a family member, will benefit from Precision Medicine withiin the next 24 months, whether or not you volunteer to participate as part of the PMI Cohort. "Precision Medicine is an approach to discovering and developing medicines and vaccines that deliver superior outcomes for patients, by integrating clinical and molecular information to understand the biological basis of disease. This approach leads to better selection of disease targets and identification of patient populations that experience better clinical outcomes." "Ultimately, the potential of Precision Medicine is that it will yield treatments that deliver clinically significant treatment effects, with favorable safety profiles. When appropriate, these new treatments are focused on a particular sub-group of patients with certain genotypic and/or phenotypic characteristics that make them more likely to benefit or less likely to experience side effects." A related concept, 'Personalized Medicine', has been defined by the President’s Council of Advisors on Science and Technology (PCAST) as 'the tailoring of medical treatment to the individual characteristics of each patient to classify individuals into subpopulations that differ in their susceptibility to a particular disease or their response to a specific treatment. Thus, products and diagnostics developed through Precision Medicine facilitate the practice of Personalized Medicine." Over the next few weeks, I'll be providing more background and analysis on Precision Medicine, including a "Patient Bill of Rights" for participation in Precision Medicine research. Patricia Seybold	on March 9, 2016 at 12:16 a.m. According to an article from Genome Web, entitled, Putting it Out There, Ambry Genetics announced that it will be placing data from 10,000 of its customers into a publicly accessible database. All the customers consented to their samples being used in research. "The company's AmbryShare database will contain aggregated data on the genetic variants found among these 10,000 customers, all of whom had either breast or ovarian cancer. The customers were all tested for variants known to increase breast or ovarian cancer risk, and Ambry then sequenced, at its own expense, those customers' exomes, the Times says...."
"Going forward, Ambry plans to contribute data from some 200,000 customers a year to its database, including data from customers with epilepsy and conditions affecting intellectual development. "Aaron Elliott, interim chief scientific officer at Ambry, tells the Times. "With our volume, we can pull out a significant number of genes just by the sheer number we are looking at." Aaron Elliott, interim chief scientific officer at Ambry said: "We're going to discover a lot of new diagnostic targets and a lot of new drug targets. With our volume, we can pull out a significant number of genes just by the sheer number we are looking at."